In the past, I’ve done lists of 24 Christmas books to read every day of December counting down until Christmas (you can see the 2015, 2014, 2013, and 2012 editions here). 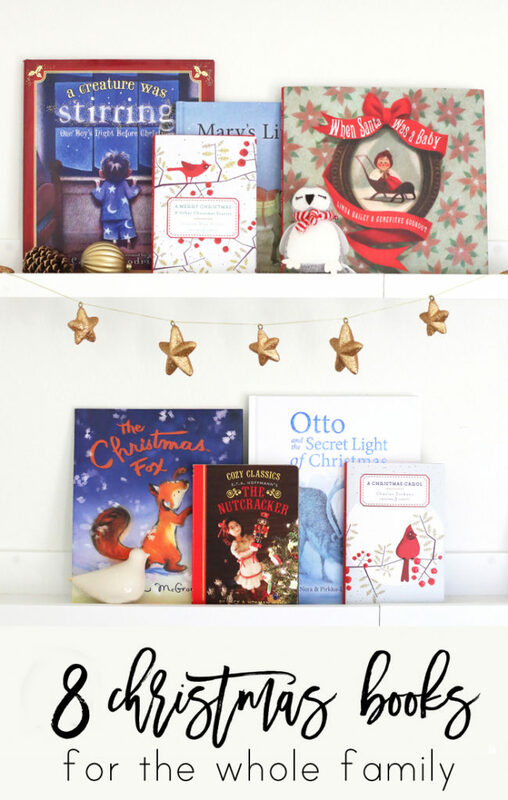 But there was never a year where I could find 24 new Christmas books I loved, so each year was a combination of new books and old books and there was crossover between the book lists. Also, I gave up on unwrapping a book a day because it just became more stressful than it was worth for me, and I like having all the books out all month long so we can read them over and over again, plus I don’t have to wrap 24 books at the end of November. Plus they look nice sitting under my Christmas tree. Anyway, here are eight new (to me) titles to check out and if you want a full set of 24, you can grab other very excellent titles from the previous lists. There’s more than enough to choose from, plus I’ll be sharing more Christmas books over on Instagram throughout the month. Four animal friends are waiting for Santa’s midnight flight, but they get more than the bargained for when a present falls from the sleigh meant for a new baby at the farm. The animals agree (some reluctantly) to get the present to its intended recipient. My girls are OBSESSED with this book. Santa comes to deliver presents and, peeking through the window, decides what to leave each occupant based on what he can see. Then you turn the page and realize he’s completely misinterpreted each sliver and the results are very amusing. I love David Small. Alice Jayne gets a crocodile on Christmas Eve and he starts eating everything in sight. The family has a million opinions about how to get rid of the crocodile (zoo! Africa!) but Alice Jayne wants to do better by this Christmas Crocodile who really doesn’t mean to be bad. This one is so sweet. My girls read it together before I did and Ella told me, “You HAVE to read this one – you’ll love it.” And I did. The animals from the field and forest are heading to a barn and keep inviting the little fox, but he’s hesitant to come along because he has nothing to offer the baby. I never get tired of this sweet sisters and in this one, when they discover that Maple is allergic to their perfect Christmas tree, Willow comes up with an inventive solution. I’m so happy that there’s a Christmas addition to this series. I got a copy of this back in August and it made me so anxious for the holidays, I could hardly stand it. I had to put it away quickly before I started pulling out the Christmas decorations while it was still 119 degrees outside. I love the Cozy Classics series and this one is particularly gorgeous. This book is brand new but has the feeling of a vintage classic. Alec loves the great spruce in his yard, and is devastated when his parents agree to let a team from the city cut the tree down and take it for the Christmas celebration. Fortunately, he comes up with a great idea that satisfies everyone. You know what’s hard about getting presents from Santa? When Santa doesn’t realize you’re so tiny you take a bath in a teacup and keeps sending presents meant for a regular-sized girl. How can Clementine let Santa know that she’s itty-bitty? That has to be the prettiest copy of A Christmas Carol that I've ever seen! I love when you post book lists, I almost always go and check my library website for every single one. Thank you! What lovely books! The illustrations are fantastic. Your blog is great too, by the way. So glad I stumbled across it.